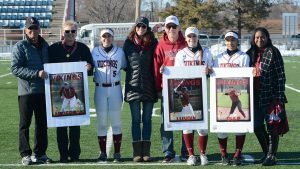 Vikings sweep Senior Day Doubleheader, Sat. VALLEY CITY (VCSU) – Emily Smith and Emilee Wilson pitched back to back complete games Sat, and the VCSU softball team swept their Senior Day doubleheader against Viterbo University. Smith struck out 13 batters in the opener as she pitched a complete-game shutout in a 1-0 victory. In game two, Wilson went the distance as she struck out eight batters and gave up just one run in a 5-1 victory. The No 8-ranked Vikings improve to 33-2 overall and are now 13-1 in conference play. The sweep came on VCSU’s Senior Day, with the Viking honoring Kadie Anderson, Tatum Lundin and Voni Culp in a postgame celebration. Viterbo drops to 12-21 overall and 7-9 in the North Star Athletic Association. Up next: Valley City State and Viterbo University rematch Sunday for another doubleheader at 11 a.m. in Valley City.